Mary has begun a new line of handcrafted jewelry at MJ Crafts Design Studio, and I will be bringing those new creations here for your viewing and buying pleasure. Many more creations are coming out...stay in contact and don't forget to visit us often and check our new items and new items 2 pages for more impressive creations. 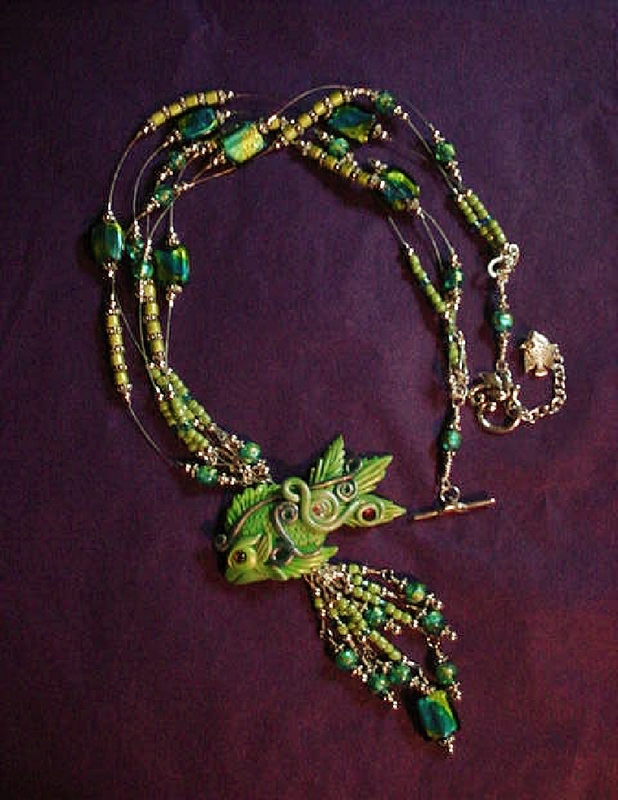 Handcrafted Dichroic Glass and Polymer Clay Green Fish Pendant Necklace -Dimensions About: aprox. 22"-24" long Description: Handcrafted with Lime Green and Turquoise Blue Dichroic medium round and square large Glass beads. Czech Lime Green and Aquamarine Glass Seed Beads are used to embellish the necklace. Silver plated beads, fish charm, crimp tubes, final chain, clasp and findings are used for final details.Swarovski Crystals are used to accent the Polymer Clay Green Fish Pendant.Beadalon 19 flexible .018" stringing wire is used to complete and embellish this unique creation.Beautiful and Elegant! More new creations will be coming very shortly. Come visit us!